We just got two bandsaws from our awesome members! While we're finding good spots and are learning how to use them, this page will become more detailed. There is a larger bandsaw for wood and a smaller one for metal. 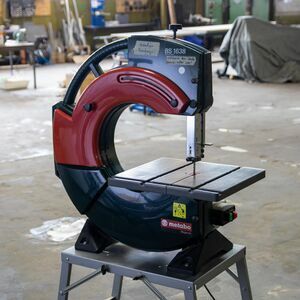 The Metabo BS 1638 W (you can probably drop the "W" when searching for accessories) is a three-wheeled bandsaw for 2225 mm bandsaw blades. We are missing a parallel fence and a table to use the integrated disc sander, please help us out if you would like to see these features added! more details in the manual! This small bandsaw does not have much power, but is nice for learning the basics and in case you just need to make some curvy or cold cuts through soft metals. The blade guides are very simple, just consisting of two pins for the sides and a bearing for the back of the blade. Ignaz is going to turn an eccentric bearing mount to increase their lifetime (by default, the blade runs too close to the center of the bearing). Please refer to the proper blade-guide distances explained in our bandsaw introduction, NOT the ones from the manual! max. blade width - ?? ?